Meeting with Congressman Jack Bergman on Moran Iron Works project. From left: NLEA President-Andy Hayes, Moran Iron Works President, and Founder-Tom Moran, Mike Mroz-Moran Iron Works, Congressman Jack Bergman, Cora McLennan-Moran Iron Works. 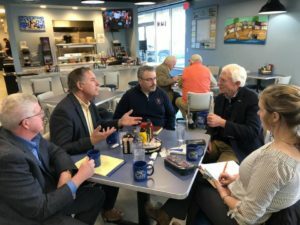 Michigan congressional leaders, Congressman Jack Bergman, along with Senators Gary Peters and Debbie Stabenow, gave their firm written support to Moran Iron Works as they pursue funding for a MARAD Small Shipyard Grant which would allow them to take on an additional marine project each year, thus creating more jobs. The MARAD Small Shipyard Grant Program provides grants for capital and related improvements to qualified shipyard facilities that will be effective in fostering efficiency, competitive operations, and quality ship construction, repair, and reconfiguration. Moran Iron Works identified their need to purchase a Python X CNC Plasma Cutting System which will replace three outdated pieces of machinery. Acquiring this equipment will increase efficiency, accuracy, quality, and profitability, and will allow Moran to take on an additional marine project each year to become more competitive in the shipbuilding industry. Increased competitiveness and efficiency equate to improved job opportunities within northeast Michigan and will add to their existing workforce. 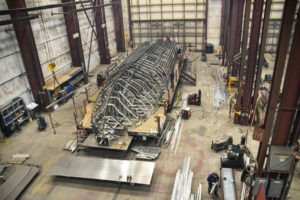 Moran Iron Works lays the Keel on the New Kayak Launching Vessel for Pictured Rocks. For more information on how NLEA can assist your business, call 231-582-6482 or email buck@northernlakes.net.